Clindamycin (brand names: Dalacin T, Zindaclin, Cleocin, Cleocin T, Evoclin) is a type of topical solution and antibiotic that has often been prescribed by dermatologists for the management of acne. While the rate of prescription is currently declining (for reasons explained below!) it is still—unfortunately—used by many today for acne treatment. If you're currently using clindamycin lotion or are considering using it to help treat your acne, read this first! How does clindamycin work to treat acne? Like other topical antibiotics, Clindamycin (or "clindamycin phosphate") helps treat acne by destroying the acne bacteria (p. acnes) on the skin and preventing further growth of bacteria. It has been prescribed to help treat mild acne, moderate acne, and even severe inflammatory acne. While Clindamycin can help control acne for a period of time, it can also come with some serious side effects. 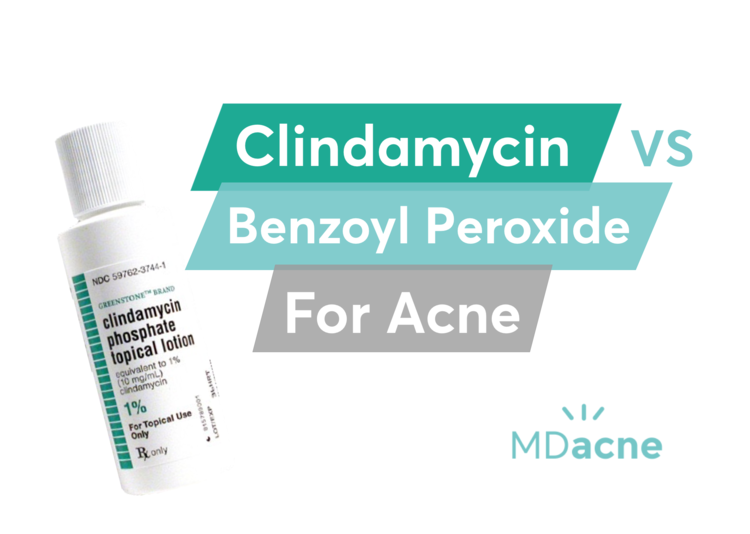 What is the difference between benzoyl peroxide and clindamycin? Like Clindamycin, benzoyl peroxide also fights acne bacteria, but it does so differently. Benzoyl peroxide actually kills the acne bacteria on contact, preventing them from developing resistance. Because of this, benzoyl peroxide medications do not lose their efficacy even with long-term use. The American Academy of Dermatology placed Benzoyl peroxide at the top of the list of anti-acne topical treatments while clindamycin and other topical antibiotics such as erythromycin are on the bottom of the list. What are the adverse effects of topical clindamycin used in acne? There are several downsides to using clindamycin or other topical antibiotics (and oral antibiotics!) for acne treatment. Prolonged use can make acne bacteria resistant to this antibiotic and ultimately, make acne worse in the future. In fact, the risk of bacterial resistance from Clindamycin and other topical antibiotics has lead to the American Academy of Dermatology recommending against the use of such topical antibiotics as a single solution for the treatment of acne. In addition to the risks of bacterial resistance and worsening of the acne condition long-term, clindamycin can be absorbed into the blood circulation and affect internal organs. Possible side effects from using clindamycin include skin peeling, dryness an irritation, while some also report diarrhea, vomiting, nausea, abdominal cramps/pain and other unpleasant symptoms (according to the FDA). Is clindamycin or benzoyl peroxide more irritating to the skin? Dry skin and general skin irritation should be avoided as much as possible in acne treatment. Once the skin is over-irritated, it's protective barrier has already been damaged. This causes more inflammation, which slows down skin healing and increases the risk for more breakouts and uncomfortable acne lesions (yikes!). Therefore, when choosing an acne treatment protocol, it's important to consider the risk of irritation. When applied topically to the skin, Clindamycin causes application site burning and itching (up to 11%). Traditional forms of other acne medications such as salicylic acid and benzoyl peroxide can also irritate and dry the skin. Fortunately, new benzoyl peroxide and salicylic acid formulations have been developed with special microparticles that penetrate the skin more easily than the standard formations. Combined with other anti-inflammatory ingredients, acne treatment products with these micronized medications show increased efficacy in the treatment of acne vulgaris with reduced irritation. Customization of these medications to a user's skin (different potency of active ingredients) will further maximize effectiveness and reduce redness and irritation. How much does clindamycin cost? As a prescription drug, the cost of clindamycin varies from person to person based on their insurance carrier. Without insurance, the cost of one bottle of clindamycin is about $125 (CVS). For those with insurance, the cost will significantly less, though comes with the added cost of a dermatologist visit to obtain the necessary prescription (typically <$100). Should you use clindamycin for your acne treatment? As a previously popular prescription medication, clindamycin can seem like an attractive option to help with the treatment of acne. 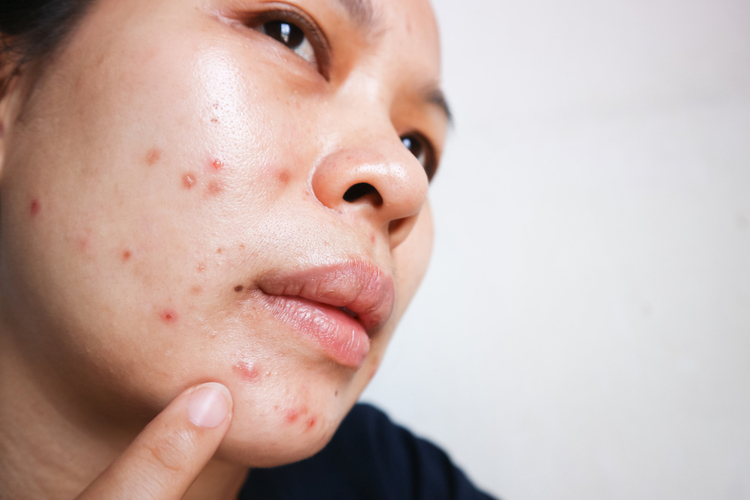 However, considering both the negative side effects, long-term outcomes, and cost, clindamycin is not a good option for treating acne and in fact, should be avoided and replaced with safer alternatives—often available over the counter. New formulations of the highly effective micronized benzoyl peroxide and salicylic acid, are proven effective without long term adverse effects. They are also more affordable, significantly less irritating, and more effective than clindamycin. Acne is a serious condition that warrants medical attention. To find the right acne treatments for your unique skin, take the free MDacne skin assessment by clicking here.